"Kotzebue" redirects here. For other uses, see Kotzebue (disambiguation). Location in Northwest Arctic Borough and the state of Alaska. Kotzebue (/ˈkɒtsəbjuː/ KOTS-ə-bew) or Kikiktagruk (Inupiaq: Qikiqtaġruk [qekeqtɑʁʐuk]) is a city in the Northwest Arctic Borough in the U.S. state of Alaska. It is the borough's seat, by far its largest community and the economic and transportation hub of the subregion of Alaska encompassing the borough. The population of the city was 3,201 as of the 2010 census, up from 3,082 in 2000. There is archaeological evidence that Inupiat people have lived at Kotzebue since at least the 15th century. Owing to its location and relative size, Kotzebue served as a trading and gathering center for the various communities in the region. The Noatak, Selawik and Kobuk Rivers drain into the Kotzebue Sound near Kotzebue to form a center for transportation to points inland. In addition to people from interior villages, inhabitants of the Russian Far East came to trade at Kotzebue. Furs, seal-oil, hides, rifles, ammunition, and seal skins were some of the items traded. People also gathered for competitions like the current World Eskimo Indian Olympics. With the arrival of the whalers, traders, gold seekers, and missionaries the trading center expanded. Kotzebue was originally known as Qikiqtaġruk, which means "peninsula" in Iñupiatun, the language of the Iñupiat. Kotzebue gets its name from the Kotzebue Sound, which was named after Otto von Kotzebue, a Baltic German who explored the sound while searching for the Northwest Passage in the service of Russia in 1818. Reindeer herding was introduced in the area in 1897. Although Alaska had caribou, the wild form of reindeer, the domesticated reindeer were brought to Alaska from Asia. A United States post office was established in 1899. Kotzebue was a filming location for the 1991 film Salmonberries. In 1997, three 66-kw wind turbines were installed in Kotzebue, creating the northernmost wind farm in the United States. Today, the wind farm consists of 19 turbines, including two 900 kW EWT turbines. The total installed capacity has reached 3-MW, displacing approximately 250,000 gallons of diesel fuel every year. On September 2, 2015, U.S. President Barack Obama gave a speech on Climate Change, in Kotzebue, becoming the first sitting president to visit a site north of the Arctic Circle. Kotzebue lies on a gravel spit at the end of the Baldwin Peninsula in the Kotzebue Sound. It is located at 66°53′50″N 162°35′8″W﻿ / ﻿66.89722°N 162.58556°W﻿ / 66.89722; -162.58556 (66.897192, −162.585444), approximately 30 miles (48 km) from Noatak, Kiana, and other nearby smaller communities. It is 33 miles (53 km) north of the Arctic Circle on Alaska's western coast. According to the United States Census Bureau, the city has a total area of 28.7 square miles (74 km2), of which 27.0 square miles (70 km2) is land, and 1.6 square miles (4.1 km2), or 5.76%, is water. Kotzebue is home to the NANA Regional Corporation, one of thirteen Alaska Native Regional Corporations created under the Alaska Native Claims Settlement Act of 1971 (ANCSA) in settlement of Alaska Native land claims. Kotzebue is a gateway to Kobuk Valley National Park and other natural attractions of northern Alaska. A Northwest Arctic Heritage Center is located in the town to acclimate National Park Service travelers. Nearby Selawik National Wildlife Refuge also maintains office space in the town. Kotzebue has a very dry subarctic climate (Köppen Dfc) bordering on the Tundra climate, with long, somewhat snowy, and very cold winters, and short, mild summers. Monthly daily average temperatures range from −3.5 °F (−19.7 °C) in February to 54.7 °F (12.6 °C) in July, with an annual mean of 21.8 °F (−5.7 °C). Days of above 70 °F (21 °C) can be expected an average of five days per summer. Precipitation is both most frequent and greatest during the summer months, averaging 10.1 inches (257 mm) per year. Snowfall usually falls in light bouts, averaging 39 inches (99 cm) a season. Extreme temperatures have ranged from −58 °F (−50 °C) to 85 °F (29 °C), with the latter occurring as recently as June 19, 2013. 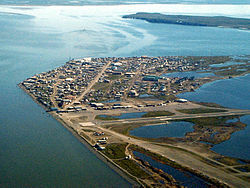 Kotzebue first appeared on the 1880 U.S. Census under its predecessor unincorporated Inuit village named "Kikiktagamute." It did not appear again until 1910, then as Kotzebue. It formally incorporated in 1958. As of the census of 2000,[needs update] there were 3,082 people, 889 households, and 656 families residing in the city. The population density was 114.1 people per square mile (44.1/km²). There were 1,007 housing units at an average density of 37.3 per square mile (14.4/km²). The racial makeup of the city was 71.19% Native American, 19.47% White, 1.82% Asian, 0.32% Black or African American, 0.06% Pacific Islander, 0.78% from other races, and 6.36% from two or more races. Hispanic or Latino of any race were 1.17% of the population. There were 889 households out of which 50.4% had children under the age of 18 living with them, 46.1% were married couples living together, 17.4% had a female householder with no husband present, and 26.1% were non-families. 19.3% of all households were made up of individuals and 2.0% had someone living alone who was 65 years of age or older. The average household size was 3.40 and the average family size was 3.93. In the city, the age distribution of the population shows 39.8% under the age of 18, 8.5% from 18 to 24, 30.4% from 25 to 44, 17.2% from 45 to 64, and 4.1% who were 65 years of age or older. The median age was 26 years. For every 100 females, there were 102.0 males. For every 100 females age 18 and over, there were 104.5 males. The median income for a household in the city was $57,163, and the median income for a family was $58,068. Males had a median income of $42,604 versus $36,453 for females. The per capita income for the city was $18,289. About 9.2% of families and 13.1% of the population were below the poverty line, including 14.9% of those under age 18 and 6.0% of those age 65 or over. Kotzebue's Ralph Wien Memorial Airport is the one airport in the Northwest Arctic Borough with regularly scheduled large commercial passenger aircraft service to and from Ted Stevens Anchorage International Airport and the Nome Airport. Kotzebue is home to the Maniilaq Association, a tribally-operated health and social services organization named after Maniilaq and part of the Alaska Native Tribal Health Consortium. Maniilaq Health Center is the primary health care facility for the residents of the Northwest Arctic Borough. The facility houses an emergency room with local and medevac support for accident/trauma victims, as well as an ambulatory care clinic, dental and eye care clinics, a pharmacy, a specialty clinic, and an inpatient wing with 17 beds for recovering patients. Health care providers at Maniilaq Health Center provide telemedicine support to Community Health Aides (CHAPs) in the outlying villages of the Northwest Arctic Borough. The CHAPs, who work in village-based clinics, are trained in basic health assessment and can treat common illnesses. For more complicated cases, the CHAPs communicate with Maniilaq Health Center medical staff via phone, video-conference, and digital images. The Arctic Sounder is a weekly newspaper published by Alaska Media, LLC, which covers Kotzebue and the rest of the Northwest Arctic Borough along with the North Slope Borough (and its hub community of Barrow). KOTZ, broadcasting at 720 on the AM dial, is the public radio station serving Kotzebue, one of two Class A clear-channel stations in the United States at that frequency (the other being Chicago's WGN). KOTZ operates an extensive translator network serving the rest of the borough. Northwest Arctic Borough School District operates two schools in Kotzebue: June Nelson Elementary School (JNES) and Kotzebue Middle High School (KMHS). As of 2017[update] they had 394 and 309 students, making them the largest schools in the district. NANA Regional Corporation is headquartered in Kotzebue. John Baker, winner of the 2011 Iditarod Trail Sled Dog Race; his finishing time that year established a race record, which stood until broken by Dallas Seavey three years later. ^ 1996 Alaska Municipal Officials Directory. Juneau: Alaska Municipal League/Alaska Department of Community and Regional Affairs. January 1996. p. 86. ^ "2010 City Population and Housing Occupancy Status". U.S. Census Bureau. Archived from the original on July 26, 2011. Retrieved May 14, 2012. ^ "The northernmost wind farm in the United States". NANA Regional Corporation, Inc. Retrieved July 25, 2018. ^ "Obama, Visiting Arctic, Will Pledge Aid to Alaskans Hit by Climate Change". New York Times. September 2, 2015. Retrieved September 2, 2015. ^ "In Alaska, Obama becomes 1st president to enter the Arctic". Yahoo News. September 3, 2015. Retrieved September 3, 2015. ^ "Kobuk Valley National Park". U.S. National Park Service. January 20, 2011. Retrieved July 28, 2011. ^ a b "Climatology of the United States No. 20 1971−2000: KOTZEBUE WIEN AP, AK" (PDF). National Oceanic and Atmospheric Administration. 2004. Retrieved 2011-01-18. ^ "Average Weather for Kotzebue, AK − Temperature and Precipitation". Weather.com. Retrieved 2011-01-18. ^ Home. June Nelson Elementary School. Retrieved on March 26, 2017. Giddings, J. Louis, and Douglas D. Anderson. Beach Ridge Archeology of Cape Krusenstern Eskimo and Pre-Eskimo Settlements Around Kotzebue Sound, Alaska. Washington, D.C.: National Park Service, U.S. Dept. of the Interior, 1986. Lucier, Charles V., and James W. VanStone. Traditional Beluga Drives of the Iñupiat of Kotzebue Sound, Alaska. Fieldiana, new ser., no. 25. Chicago: Field Museum of Natural History, 1995. Wikimedia Commons has media related to Kotzebue, Alaska. This page was last edited on 6 April 2019, at 12:23 (UTC).